It measured 96cm (38\") long with an estimated girth of 50cm (20\"). On September 8th., Belgian anglers Guillaume Verlings (l) & Jean-Paul Hendricks (r) both caught their First Ever Salmon! Both fish were sea-liced! Guillaumes\' was the Heaviest First Salmon of 2009! Blackwater Lodge beat 7 – Upper Kilmurry on Wednesday, February 17. The Lodge will once again offer free fishing from Monday Feb. 22 to Friday, Feb. 26 inclusive. This graph should update itself each time you log in until the end of February. The river is in superb fly order. We’re still waiting for our first springer to be caught, but are seeing some fresh fish running through every day. If you missed The Nationwide programme on Friday, February 19 - which was entirely dedicated to fishing - you can access this on the Internet for 21 days after broadcast on http://www.rte.ie/player/. Took a few pics at Swords Show last weekend & put them up on Youtube. He was fishing yesterday (March 6th) with Connie Corcoran on Ballinlovane and took the fish on Flying C at Cloonbeg. 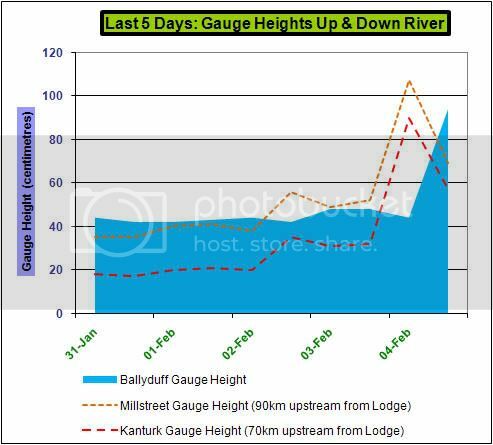 Here's the current water level on the Cork Blackwater at Ballyduff. On Saturday June 12), four fish were caught - 3 on spinner & one on fly. On Sunday, June 13, there were 3 grilse taken on the fly. Clarity is now a good 3 feet. 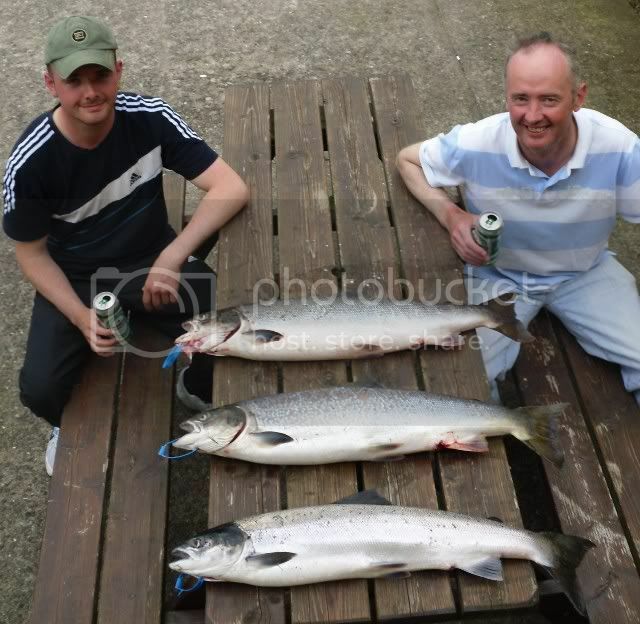 with a 12.4lb on fly on Ballinaroone & his fishing partner Tim Quinlivan also had two on fly of 11.9 & 9.1lb. Tim's largest was also the second heaviest weighed fish this year. The month of July produced 169 salmon for a total of only 183 rod days. This is the sixth best total for the month since I took over the Lodge at the beginning of 1986. 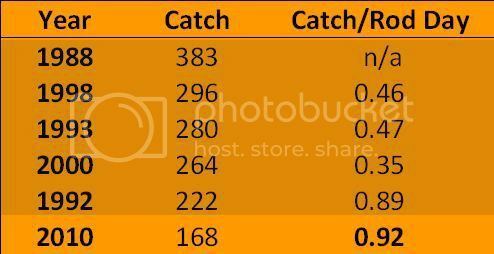 It is the best catch for the month since the year 2000, when 263 were caught for 750 rod days. 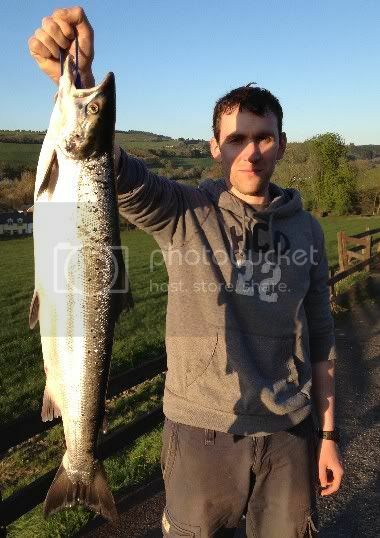 on Beat 3 - Ballinaroone by Mossy McElligott (12.4lb) & Tim Quinlivan (11.9lb). There have also been at least four very large fish lost in the second half of the month. The table below shows the figures for the six best months of July. Only the all-time record year of 1992 (when 1511 fish were taken) has a comparable catch per rod day! Total catch for the season to date is 219.
after an afternoon on the river with his famous mum Glenda on July 18! The river is still fining off slowly from the small floods on July 19 & 23. It is now @ 0.18m on the gauge with ~5 feet clarity. Once again there is a huge buildup of fresh fish in the tidal reaches & a good number are running into the main river. 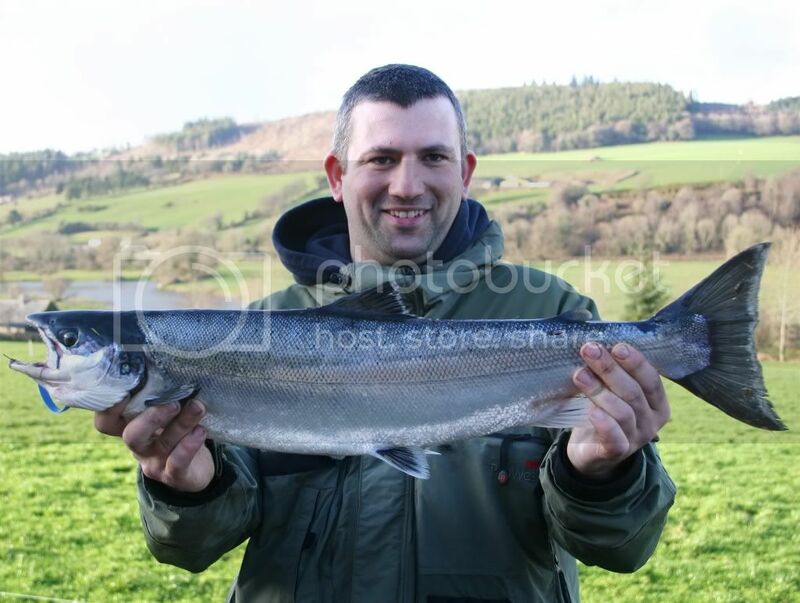 Some of the lower beat - in particular Kents & Lower Kilmurry - are hold a good head of fish. With predominantly dry weather for the coming week, the river remain at summer level. There are plenty of fish running - both hefty grilse & larger summer salmon. ...............................Season Total: 652 for 1,342 rod days (0.49 fish/rod day). ....................................July Total: 168 for 183 rod days. ...............Best Day of the Season: September 26 - 26 fish to 16lb. ...............Best Catch for One Rod: Eleven fish on September 21st. ......Number of First Ever Salmon: Thirty-five in total for the season. 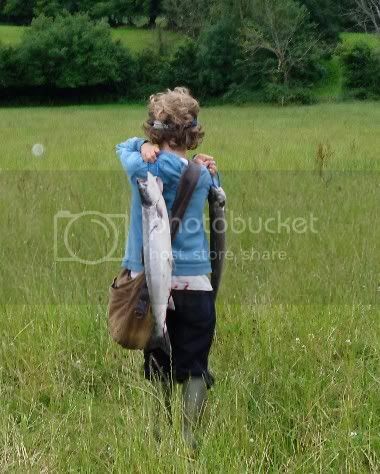 Proportion of Fish Caught on Fly: Second Highest Ever for the Total 2011 Season. 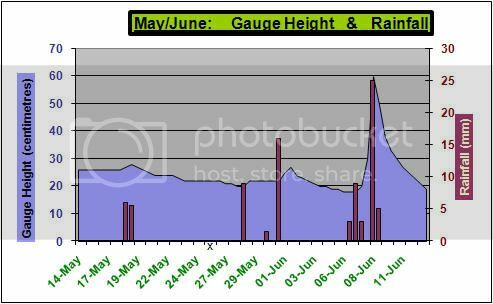 ........................................................Highest Ever for the months of May & June. ........................................................Second Highest for the month of September. were issued on Friday, November 19. The quota for the Blackwater has been raised to 5,859 from the 2010 quota which was 5,054. The number of tags for the spring (February 1 to May 11) has not been confirmed yet. so we are still waiting to hear if it will be one or three tags. & got the latest on the runs of fish into the Blackwater. There were reports of 7,500 fish that had run into the river in the 8 days from October 27. Just before the Fair on the weekend of November 13/14, this figure had jumped to over 15,000....................! This bodes well for our future stocks of salmon. The First Spring Salmon is Landed on February 3rd.! with Glenda on Thursday afternoon. 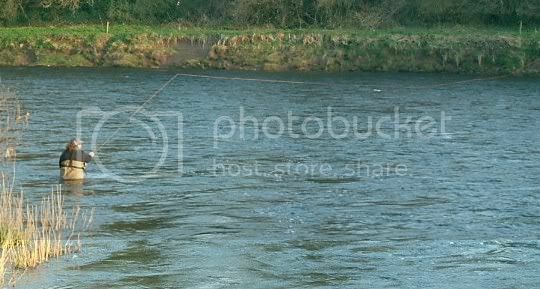 After the lesson, Glenda invited him to fish on for the rest of the afternoon on Upper Kilmurry. He hooked and landed a lovely fresh fish of about 8lb. on a fly he tied himself. It was a colour variation of the PoshTosh as seen in "Trout and Salmon", February 2010.
to land, having jumped half a dozen times. Derek - a firm believer in catch and release - carefully returned the fish alive. as he was fishing on his own - the only rod out on the fishery in fact today. This was the river below the Lodge today. 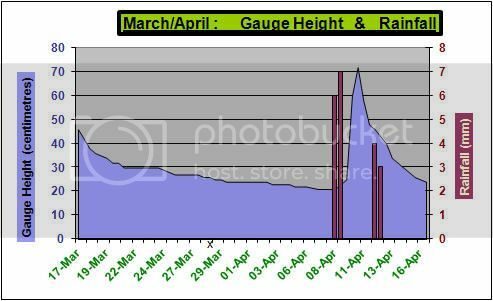 This is the gauge height on the upper & lower river for the last five days. On the 3rd., the river was at a perfect height and clarity for the fly. On the 4th., the lower river was up approximately half a metre but peaked late evening. There was very little fishing effort and gales, but a couple of fresh silver fish were seen jumping amongst the kelts. Certainly spinnable for the 5th. Fly is doubtful. Only 2 rods out on the river yesterday. and caught this 6.6lb. fish on Flying C on the Island Stream on Lower Kilmurry. Sea-lice can be seen in the picture - two on the top of the tail and one below the adipose. There were more on the back & the head of the fish. They also caught a few kelts. but also saw a fresh springer show that they estimated at 15-20lb. - also on Lower Kilmurry. 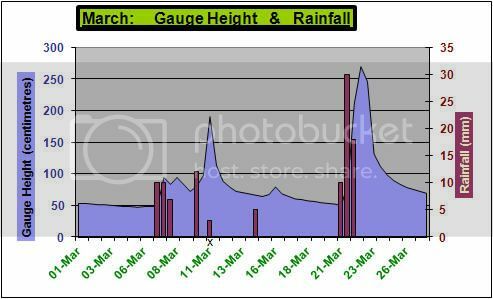 The upper river had a slight (5cm) rise yesterday. and this has meant that the lower river has held it's level at 0.85m. needing to be below about 0.6m to be able to wade and fish comfortably. The weather forecast now looks as if we can expect a dry spell of at least a week. This should ensure that the level will come down to fly order. 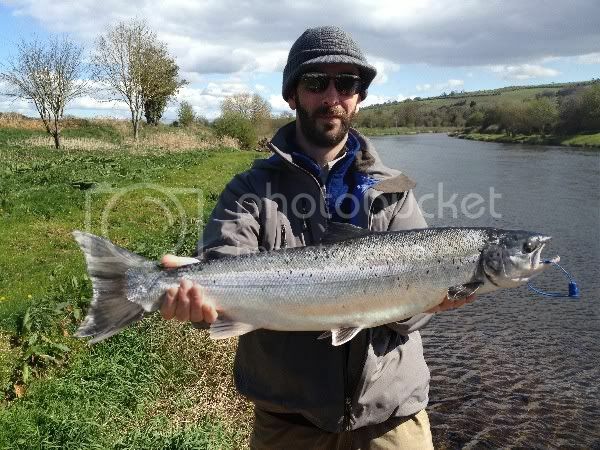 When it will be very interesting to see how the upper beats from Ballyhooly to Mallow will fish. The Great Spring Fishing continues......! 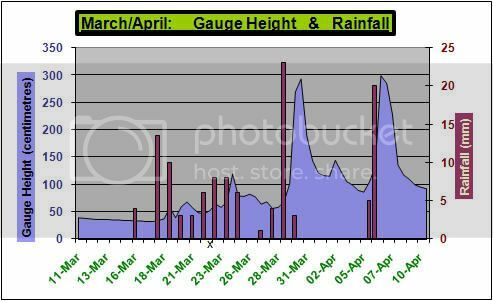 Despite the fact that there have not been many anglers out fishing and the water has been very low for much of the spring, we have had remarkable success. February: 5 fish caught in total, all between February 3-14 for only 30 rod days. Joint Best February total since 2004 & joint Second Best total since 1994. 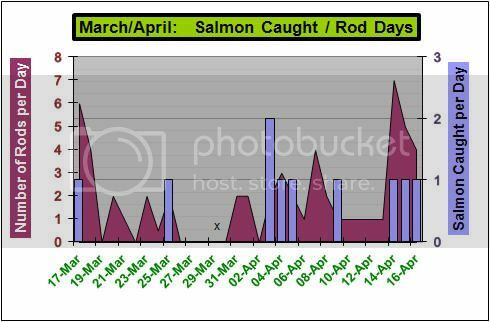 We took four fish for March for a total of just 43 rod days, which was a remarkable achievement as for most of the month the river was at summer level & we were basking in unseasonally bright sunshine. April gets off to a Great Start! Despite extremely low water in the first week of April, four springers were landed in 3 days for only 7 rod days in total. two fish in one day - and they were both on fly on two consecutive casts! & I sent him to Lower Kilmurry on a cold blustery day with a NW wind & air temps from 7-10ºC. right up at the head of the Island Stream in the fast water - no surprise as water temp is now just above 52ºF. This was his first springer of the 2012 season. a second sea-liced fish from the very same spot. Both fish were like peas in a pod. The second fish (above) was weighed in later at the Lodge at 8.3lb. Kieran saw a number of other fish throughout the day. 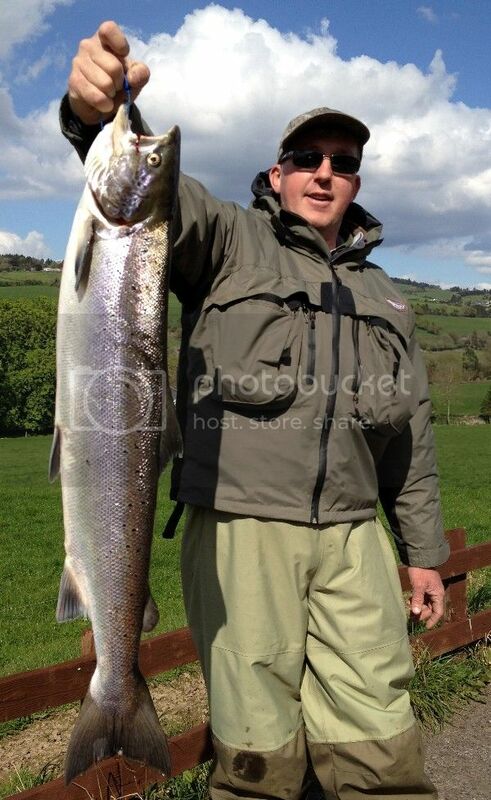 John Lalor (Cahir) caught this 6lb sea-liced fish on fly on April 4th. This was his first fish for 2012. 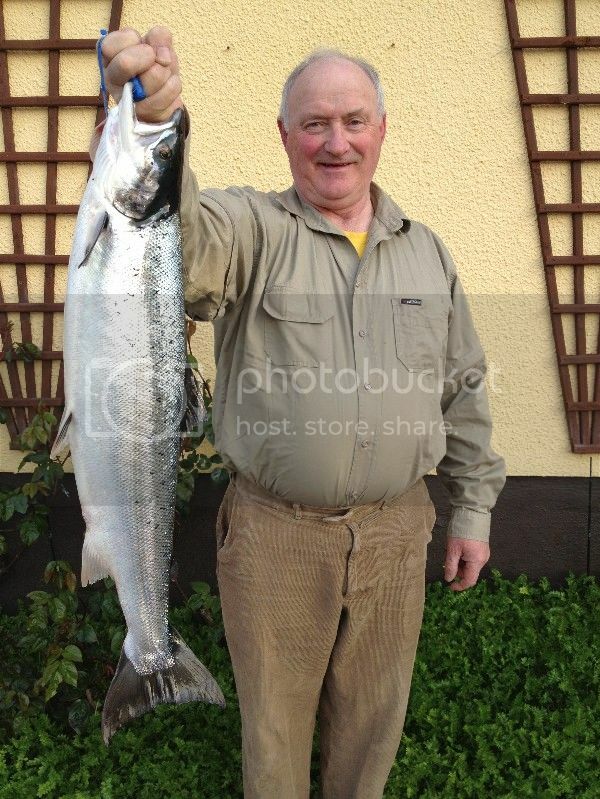 Joe Tynan (Kildare) caught this 8.4lb. very fresh fish on spinner on April 5th. It was his First Ever Salmon! It didn't have sea-lice but they had only just fallen off it. It is one of the earliest ever recorded First Fish on the fishery! The First Grilse of the 2012 Season is Caught! & went out to the river about lunchtime for a cast on the Kilmurry beats. About 4.00pm Glenda went down to meet him & she arrived at the Hut Pool to see Ken playing a fish. to net a beautiful sea-liced 4 pound grilse that had taken Ken's tube fly. This is probably the earliest grilse that has ever been taken on the fishery. Biggest Fish of the Season so far!!!!!!! 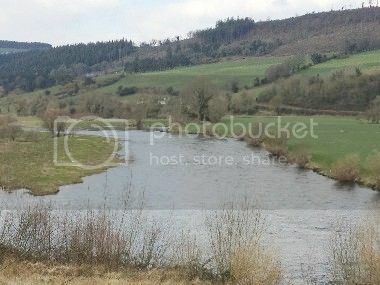 Jim Shanahan from Castletownroche was fishing an upper beat & phoned me to ask if he could switch to another upstream beat. James hooked & lost a fish on a Toby. Jim caught the Biggest Fish of the Season a few moments later - 12.4lb on Flying C at the Road Pool. This lovely sea-liced 7.3lb. 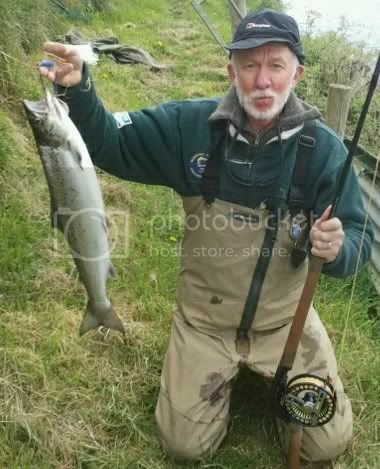 fish was caught by Terry O’Keeffe (Midleton, Co. Cork) on Lower Kilmurry yesterday. 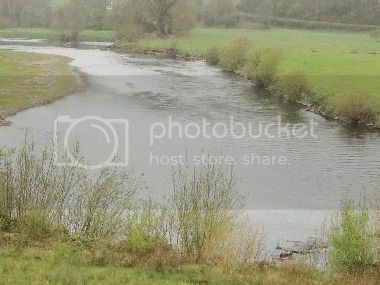 The river continues to fine off today & was at 0.25m at 16.00. 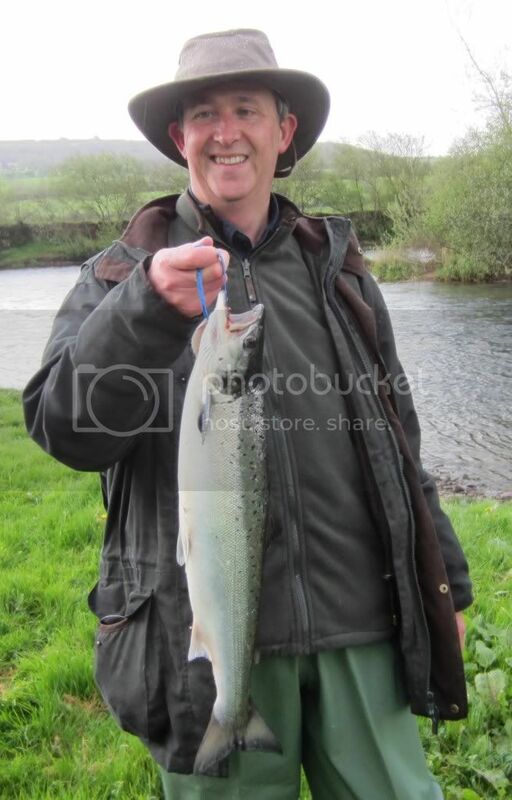 Another very fresh fish was caught today on spinner – only our second from the upper river. The total for the Lodge fishery is now 8 fish for April to date for only 37 rod days. This is the river below Blackwater Lodge at 16.00 today. There is more rain coming through the week, with storm conditions for tomorrow (Tuesday). There's no problem for availability of fishing at present. & I’ll add you to our Newsletter circulation. 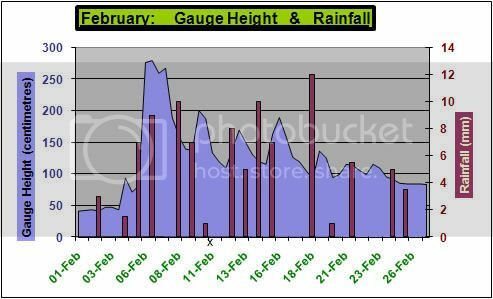 We are having a period of dry weather now which is due continue until well into next week. and will only improve further in the coming days. 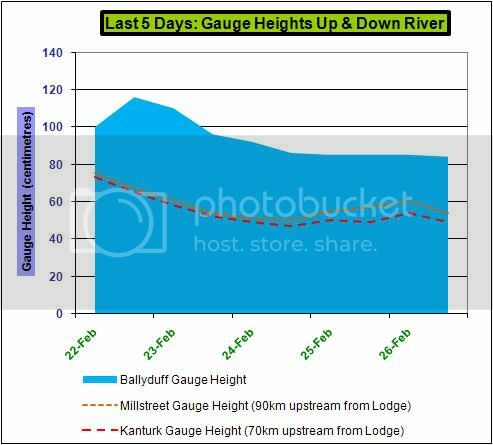 The Ballyduff gauge is on 0.70m at 5.00pm today. should be fly-fishable by tomorrow & all of them should be in fly order by the weekend. Temperatures are cold with the air struggling to get to 5C during the day & is about 0 to +2C at night. - combined with the flood fining off - will encourage more fish to move in. Prospects are looking very good for the Easter weekend. and to encourage more anglers to come to the Blackwater. We are keeping the prices the same for 2015.
and don’t hesitate to contact us if you would like any further information or would like to make a reservation for the coming season. There is an excellent stock of spawning fish on the upper Blackwater according to Fisheries officers. which is rather early especially as we have had a mild winter so far. Perhaps they know more about the coming weather than we do! For the last 3 years, the Blackwater benefited from an extension to the salmon season to October 12. The Minister has decided not to continue this in 2015. 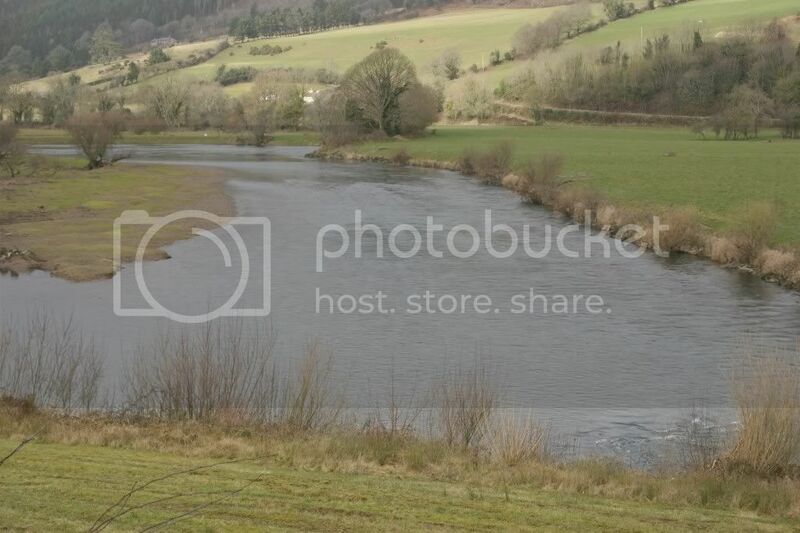 The quota for the river is 5,752 which is the second highest in the country next to the Moy. It's always advisable to book early to ensure your place - especially for the prime weeks. Book and pay in full now & benefit from a 1% per month discount. for anything from fly-casting tuition to fishing, accommodation or tackle. Very prompt service with vouchers created to order & delivered to you by return by email. so if you'd like to hone your skills before Opening Day then get in touch with her.